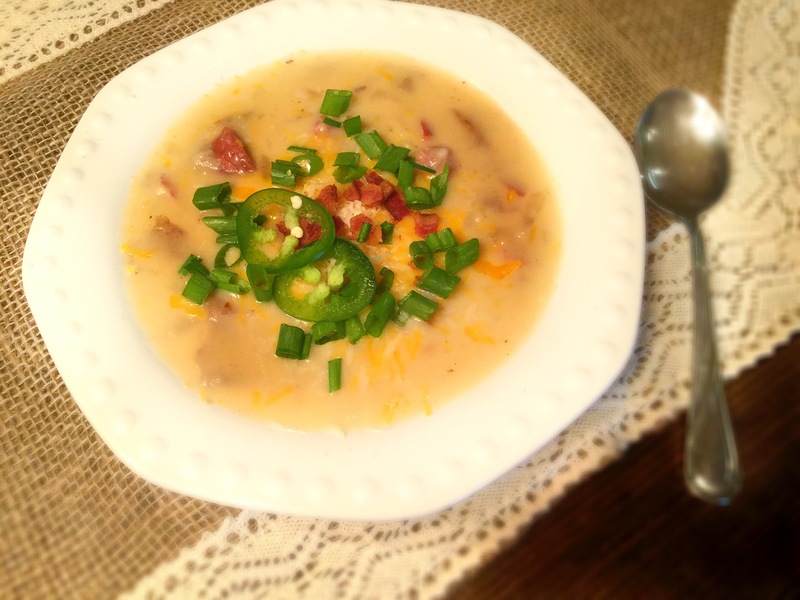 Due to the wacky weather of a Texas Spring, it fortunately still affords us the opportunity to enjoy a warm bowl of soup. Now, I won’t delve into the rich, hearty, creamy versions that I indulge in come Fall and Winter. I will, however, sit down to a light broth style. So back to THIS bowl of light and flavorful soup, my other tips and/or advice is to use the hot Italian sausage, not the mild or the sweet. If you insist on the others, so be it, but I promise this soup is anything but spicy. Also, please drain and rinse your beans with a fine mesh sieve or colander. Removing the extra starch the beans contain in the can will ensure a light broth. Now, I suggest if you’re in a slump for what to make this week, please try this out! You can serve it with warm bread and butter, a half sandwich or a light salad… and life will be good. 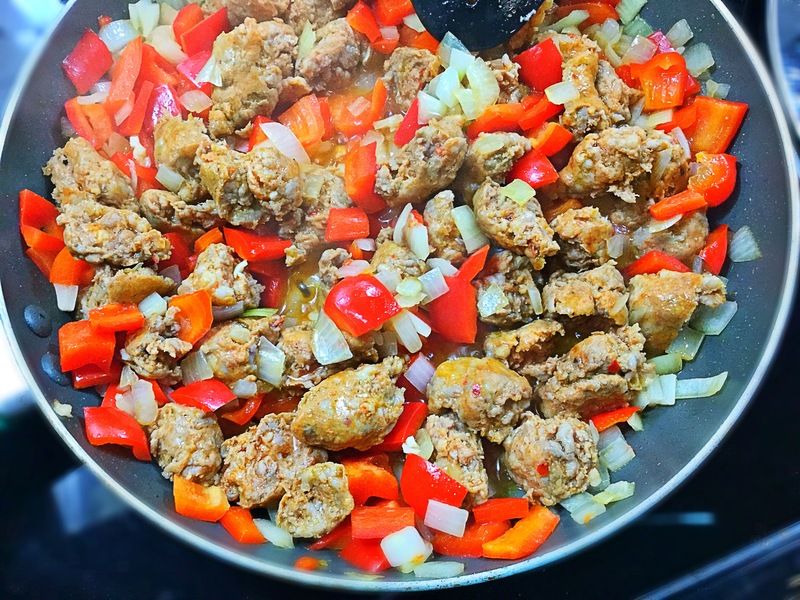 In a skillet on your stovetop, over medium heat, brown the Italian sausage with the onion, garlic and a hefty pinch of salt and pepper. 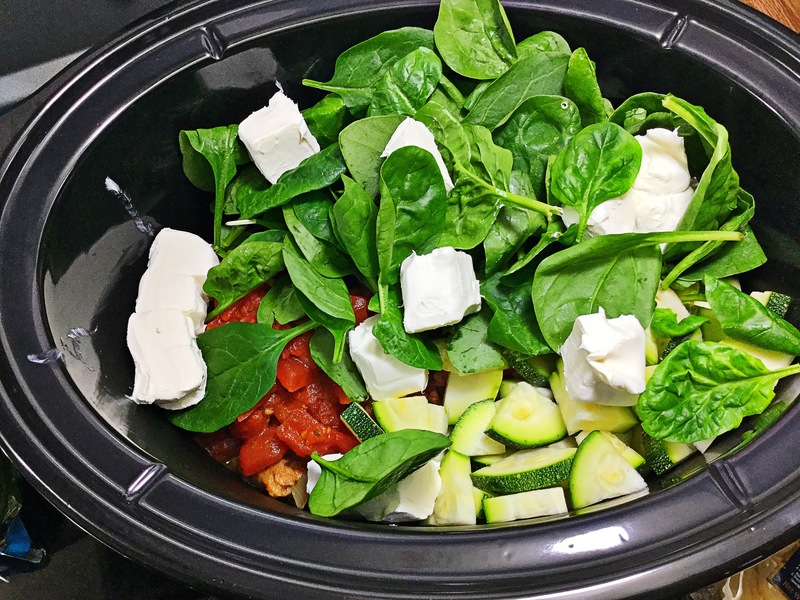 Drain and add the cooked meat mixture to your slow cooker along with the beans, chicken broth, tomatoes and spinach leaves. Set the slow cooker on HIGH for 3-4/LOW for 5-6 hours. To serve: Ladle into bowls and top with a bit of the fresh basil and parmesan cheese and serve with warm crusty bread. Enjoy! 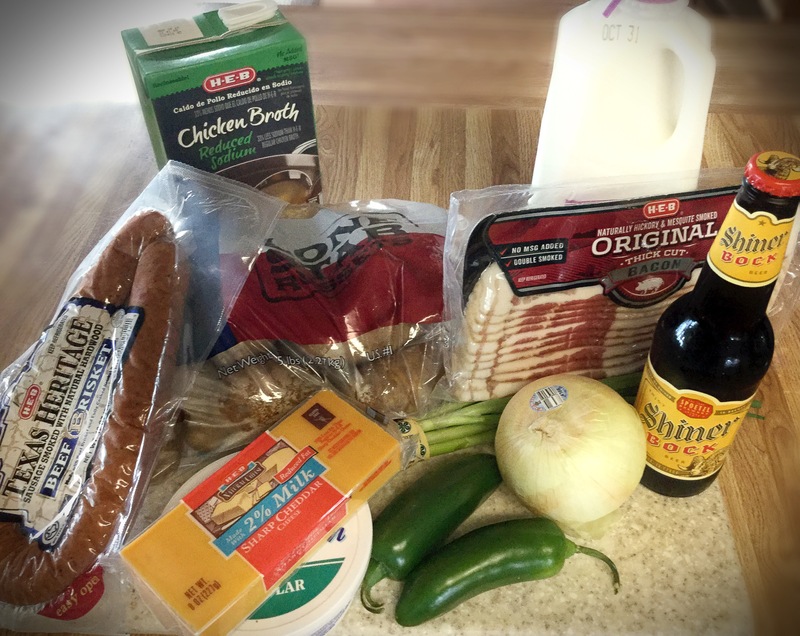 I’mmm baack….with my awesome “Spanglish” in the kitchen! Which, more often than not, means that something yummy is cooking up! 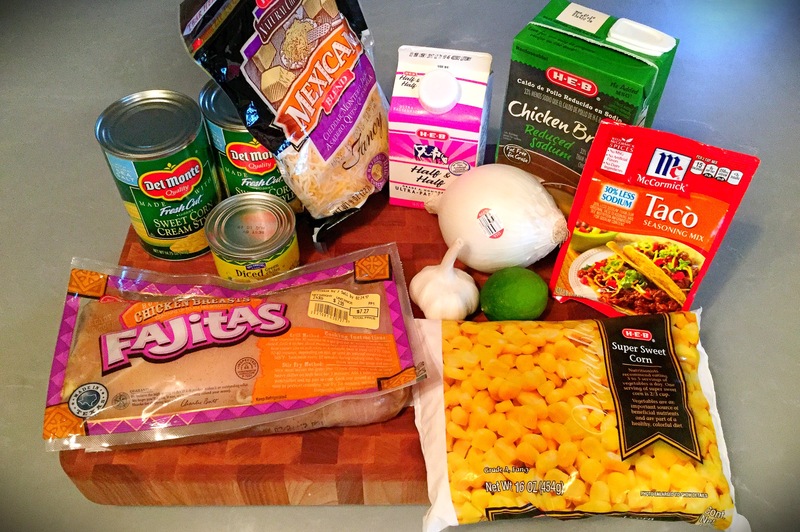 So today, mi amigos, I bring you a Carly rendition of pozole (or posole, depending what side of the tracks you’re on)! In translation, pozole means “hominy”, which is basically a large, soft corn kernel. 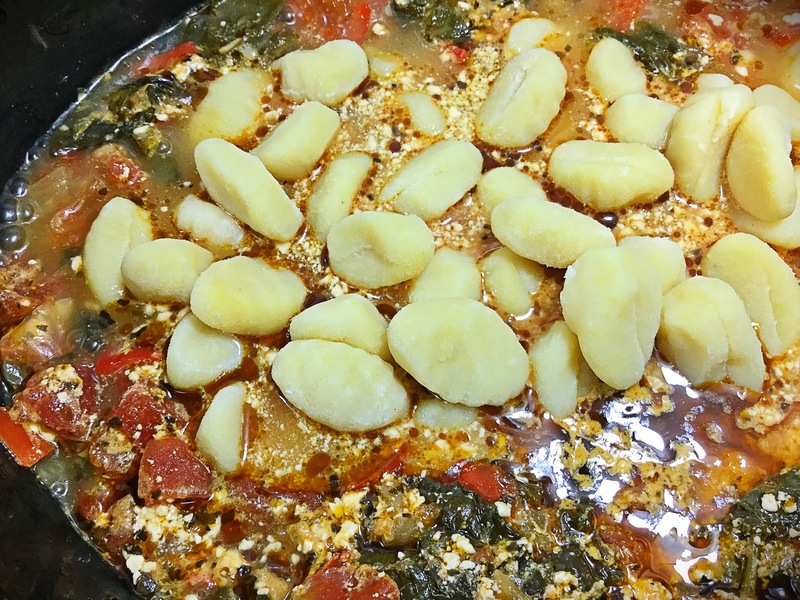 This hominy is then stewed with a meat, peppers, and broth and served with various toppings for your taste bud’s enjoyment. Now, typically, I like to make the rojo (red) version with seared pork chunks, but today I went out of my comfort zone and opted for verde (green) and chicken! I must say, though quite different flavor profiles, this one is equally amazing! A bit tart from the tomatillos, but the charred peppers and garlic yield that smokiness you want and they both pair wonderfully with the slightly salty broth and tender shredded chicken. In closing, winter is not yet over (but please hurry up) and we still crave that bowl of warm soup on a cold day. So next Domingo (that’s Sunday to my non Spanglish friends), try out this pot of yumminess! It will not disappoint! Preheat your oven to 450 degrees. Line a large baking sheet with the tomatillos (cut side down) and also place the poblano/Anaheim and jalapeno peppers along with the whole garlic cloves (still in husks) beside them. Place your baking sheet on top rack, 6-8″ from the broiler and turn the warm oven to HI Broil. Watch closely with oven door cracked, but allow the tomatillos to brown and soften and the peppers to bubble up and char, turning with tongs as needed. Remove and place all of the charred peppers in a large zip lock gallon bag. Close and allow peppers to steam for 15-20 minutes. Once time is up, peel off the pepper’s skin and stems and scrape out the seeds from each. You can also squeeze the roasted garlic out of their skin. 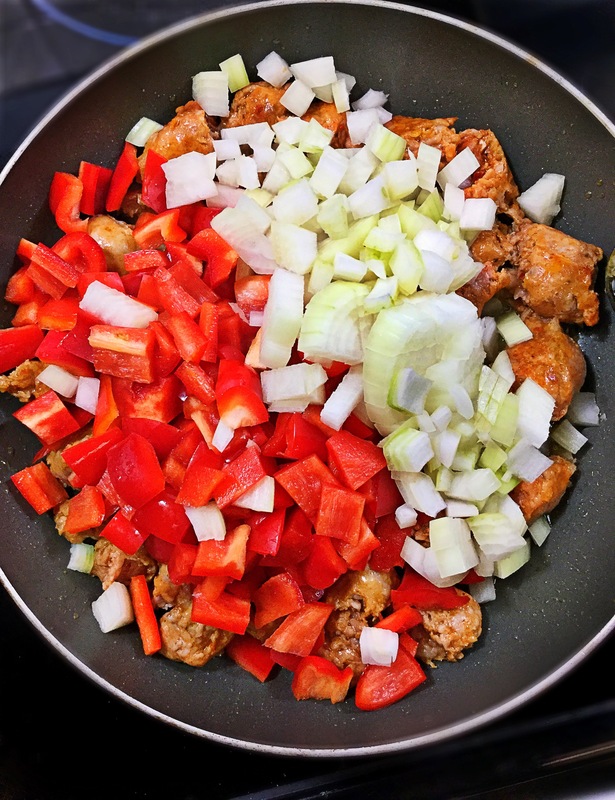 In a blender, combine 1/2 cup of chicken broth with the now roasted tomatillos (and any sheet pan juices left behind), steamed chilies and peppers, garlic cloves, cilantro, cumin, Mexican oregano, lime juice and a pinch each of salt and pepper. *If you like a thin broth, you can now strain this through a fine mesh sieve into a bowl and discard any extra skins/seeds. However, I like the rustic’ness of it all and do not strain. In a large Dutch oven pot (with lid), heat 2 tablespoons of canola oil over medium-high heat. Add in the cut up chicken thighs and sear and brown all sides; also add in the diced onion. Once seared, pour the remaining chicken broth over the browned poultry to deglaze the pan; scrape up all of the brown bits on bottom of pan with a wooden spoon. Flavor right there! Next, pour in the Verde sauce you made in your blender along with the drained hominy and green chilies (I also like to add another teaspoon or so of cumin and Mexican oregano here again). Stir to combine. Bring to a boil, drop way down to a simmer and cover. Let cook, stirring occasionally, for 2-3 hours. Slightly shred chicken chunks, if desired. Ladle into bowls and top with your desired garnishes, serve with warm tortillas. Enjoy! Besides the scents, visuals and tastes of pumpkin, nothing says Fall more than a warm bowl of soup! Especially a creamy bowl of New England’s favorite, the clam chowder! Now yes, I know I live in the south, but I’ve had reoccurring dreams of visiting the east coast to watch the leaves change while sipping on hot cider and bobbing for apples. Maybe sneak in a visit to ‘creepy’ Salem too…basically every east coast Fall cliché IS on my bucket-list. One day…. 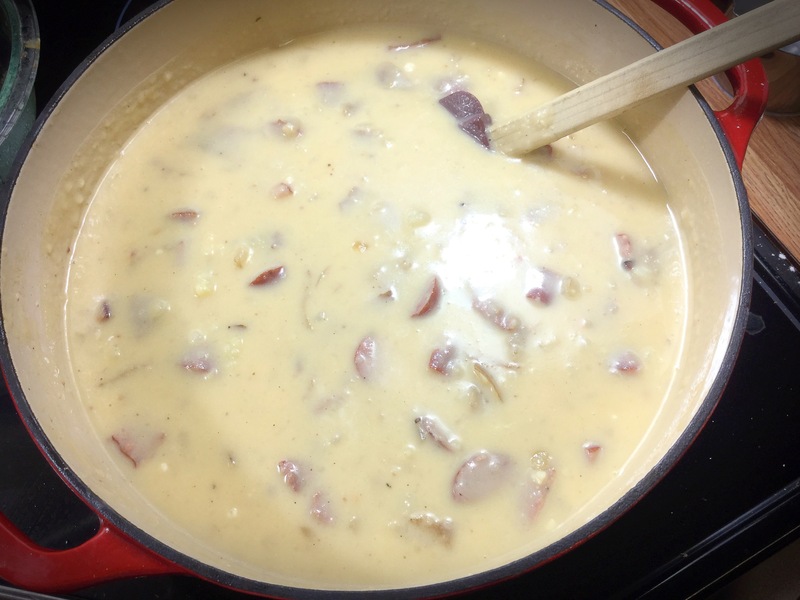 So for now, I light a spiced candle and get out my candy apple red Dutch oven to reinvent the classic into our family favorite, Chowder Fries! …quick toying with me Fall and just get here already!! *You can absolutely use vegetable broth instead, but I find that the chicken stock brings a richer flavor. Heat a large heavy bottomed pot or Dutch oven to med-high heat and add in the olive oil and bacon and cook until crispy. Transfer the crisped bacon to a paper towel lined dish and set aside. Keep the bacon grease in the pot. Next, melt the butter into that bacon grease and then add in the onions, stirring often, followed by the garlic. Sauté for 3-4 minutes until the onions are translucent and finally sprinkle in the thyme and stir together. *Meanwhile, if making a bag of frozen fries, preheat the oven and line a baking tray with parchment or foil for easy cleanup. Whether frozen or not, I like to lightly coat my fries in a bit of oil and dusting of cornstarch, toss together. This creates a great crispy exterior! 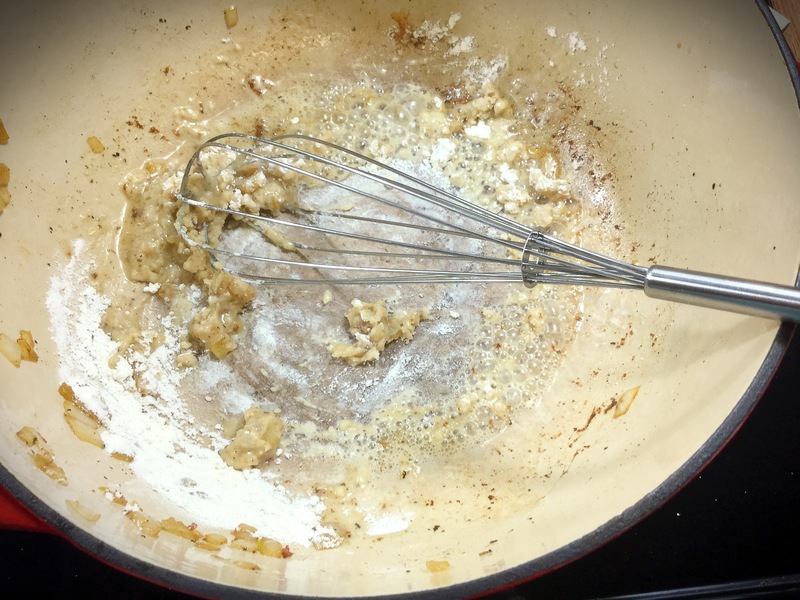 To the sautéed butter, onions and garlic, whisk in the flour for about 1 minute till everything ‘clumps up’ and is lightly browned. To that, slowly whisk in the chicken stock/ or broth, milk, the juice from the clams and toss in the bay leaf. 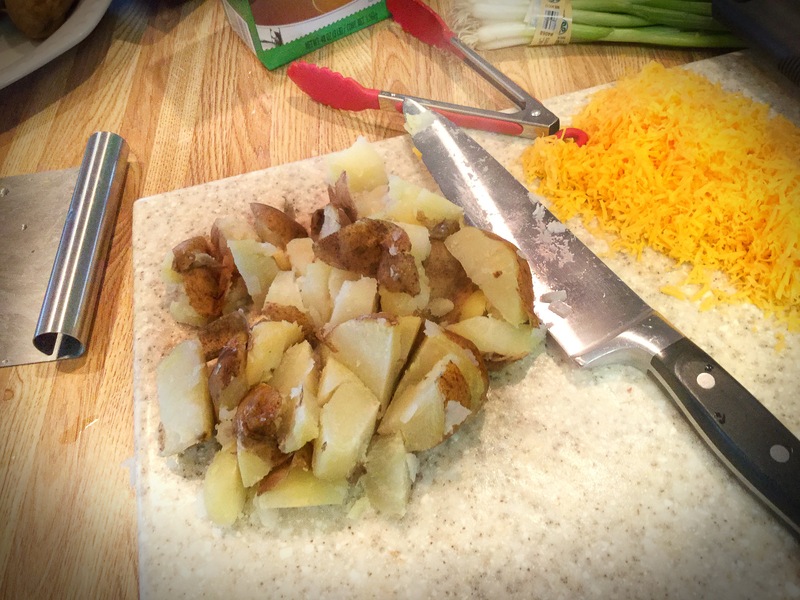 After a couple minutes of whisking to incorporate, stir in the diced potatoes. 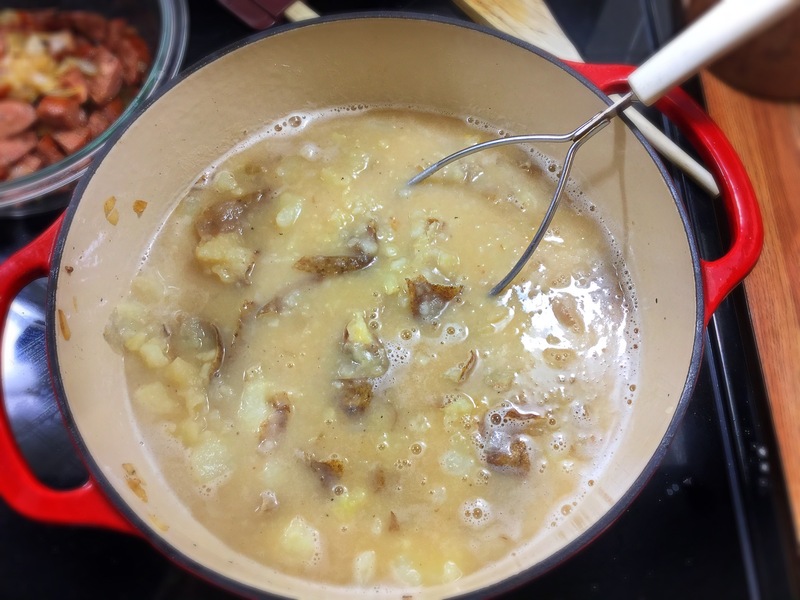 Bring this mixture to a boil and then reduce to a simmer and cover for 15 minutes; potatoes are tender. **Fry or bake your fries during this time. Once time is up, stir in the half & half, the clams and add in your salt & pepper to taste (I am pretty heavy-handed with that myself). If eating family style, season the French fries with salt or even better, Old Bay, and transfer to a serving platter. Ladle the warm and creamy clam chowder over top the hot fries and top with the crisp bacon crumbles and parsley and/or scallions! Sooooo good! Enjoy! It’s one of those weird weather times of year…Is it hot out? Is it cold?? Will it be both of those in just one single day? Yep! Yep! Yep! So while in the daytime I am craving my favorite warm, grilled spicy Mexican corn on the cob, I’m not about to go stand out in the cool evening rain to attempt it. What’s my solution? This simple recipe of course! As I stated just above, I’m all about Mexican street corn. 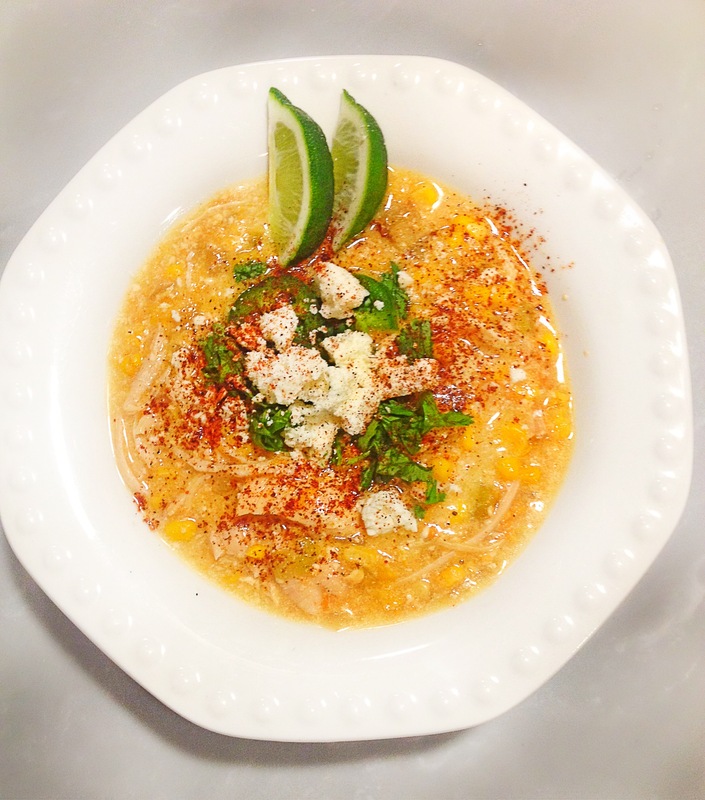 I’ll take it on the cob (elote) or in a cup (esquites) and now I’ll take it out of my slowcooker in chowder form! The added shredded chicken in my recipe helps to hearty up this meal and the garnishment of queso fresco, lime, cilantro and chili powder make this legit! You can’t eat just one bowl, promise!! *Vegetarian? Simply omit the chicken and prepare as written. 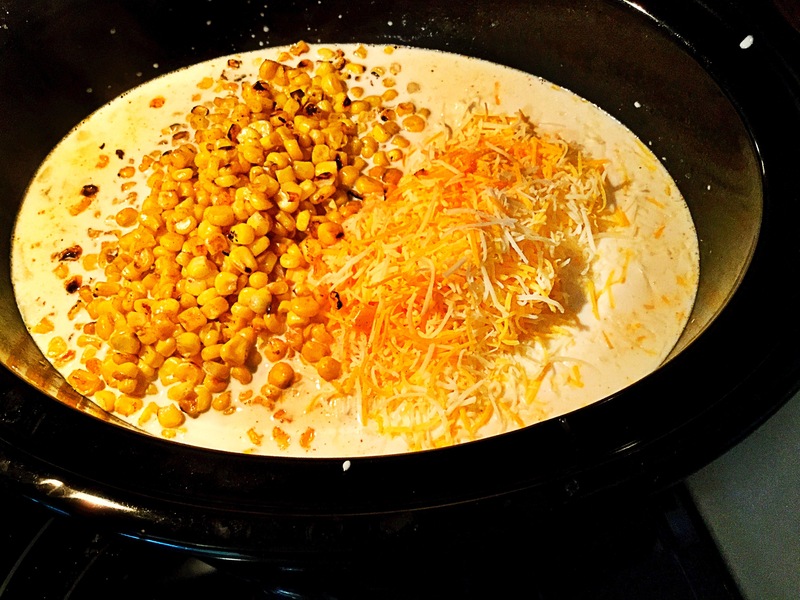 *The sautéing of the onions/garlic and roasting of the corn is optional, as you can add straight to the slowcooker. 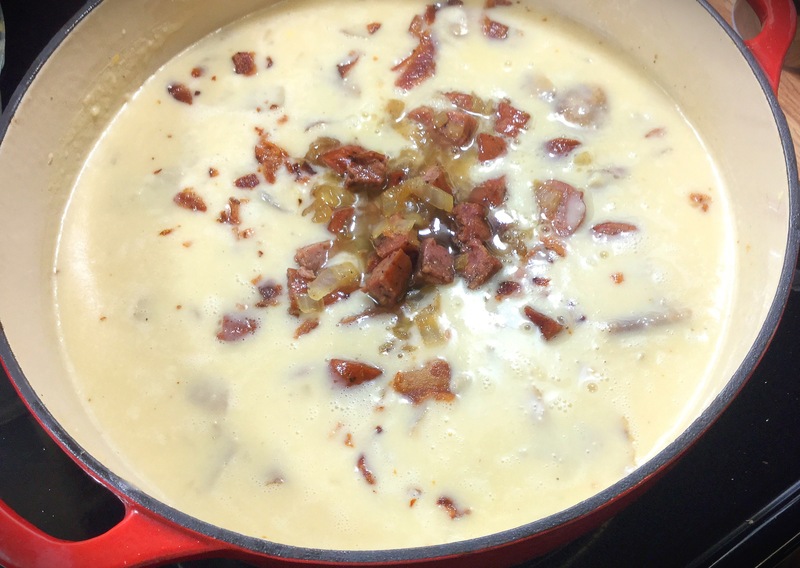 However, you’ll REALLY enhance the flavors of the chowder by doing this one extra step. The 5 minutes it takes is worth it friends! If you read the opening paragraph to this recipe, you would have noticed the key words ‘simple‘ and ‘easy‘. So follow along closely 😉 …. Heat a the extra virgin olive oil in a skillet over medium heat. Add in the onions and sauté for 3-5 minutes, till slightly soft and translucent. Add in garlic and cook for 30-60 sceconds. Pour the onion/garlic mix into your slow cooker sprayed with a bit of non-stick spray. In that same pan, crank up the heat a bit and pour in the cup of frozen corn. Toss and allow to blacken just slightly and then also add to the slow cooker. 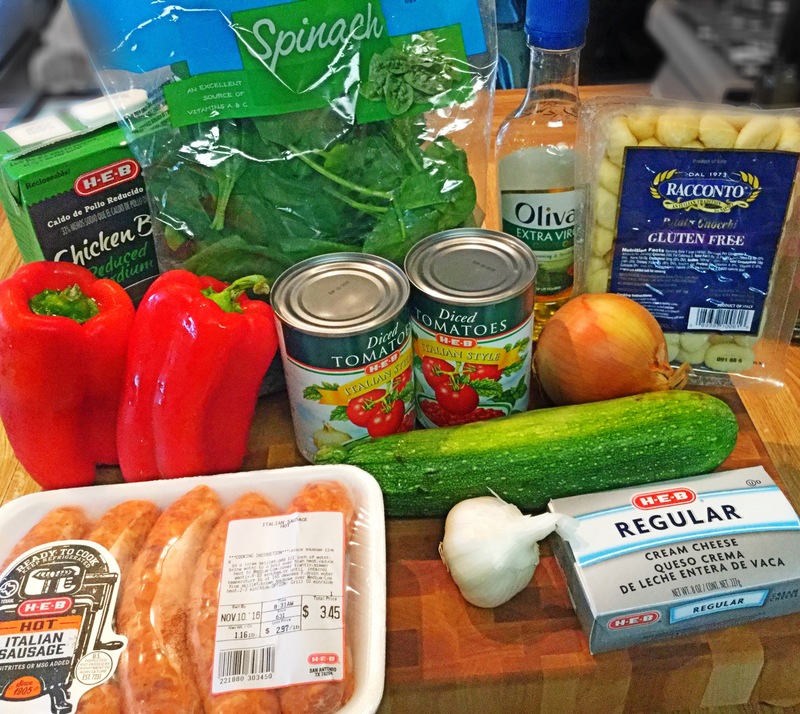 Next, add all the remaining ingredients (except the garnishes) to the slow-cooker and stir to just combine. Cover and set on low for 6-7 hours. 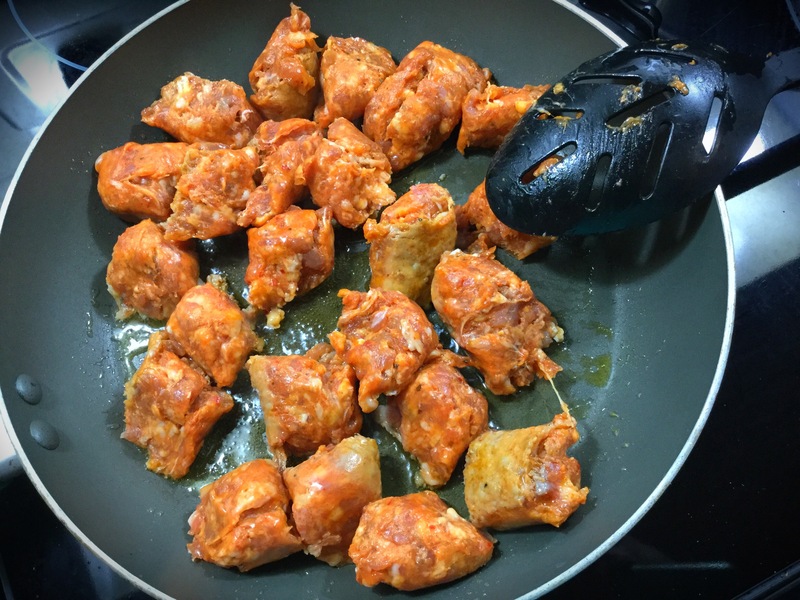 When finished cooking, remove the lid and shred the chicken with two forks. Ladle into bowls and top with the crumbled cheese, cilantro, chili powder and a squeeze of lime. Enjoy!! It’s a beautiful October weekend…and by beautiful I mean it will not stop raining, the windows are open in my home with temps being in the 60’s and my Fall candles are burning. Yes, these are the things that bring me pure happiness. Well…that and a big pot of comforting soup of course. I decided to make this dish so it can last us a couple of days..more time to enjoy doing nothing. Bliss. Well after trial with no error, I can assure you that this is a winner! Please enjoy with your family on a chilly day with a few slices of crusty bread for dipping! Well start with getting a few of the ingredients prepped! Now you can absolutely bake your potatoes in the oven as you normally may, but if you’re in more of a time crunch, then just “bake” them in your microwave till soft. 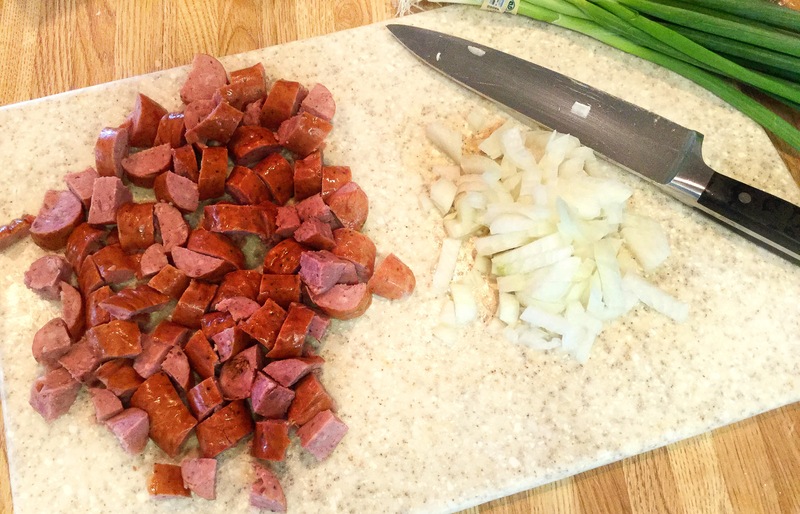 While the potatoes are becoming fork tender, you can slice up the kielbasa sausage and chop up the onion. 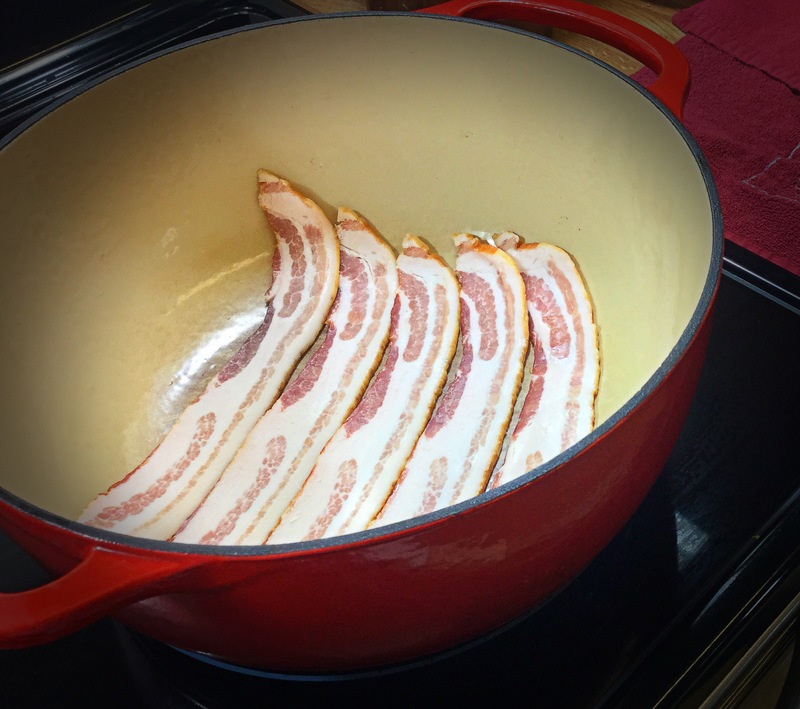 In a large pot/dutch oven, lay in the bacon and cook till crisp (medium heat). Transfer to a plate and set aside. Now in that glorious bacon grease (do not drain), add in the cut up sausage and the chopped onion. Cook till the onion becomes translucent, stirring occasionally. After about 5 minutes the onions and sausage will be good to go. With a slotted spoon transfer them to a bowl and set aside, while keeping the grease in the dutch oven. 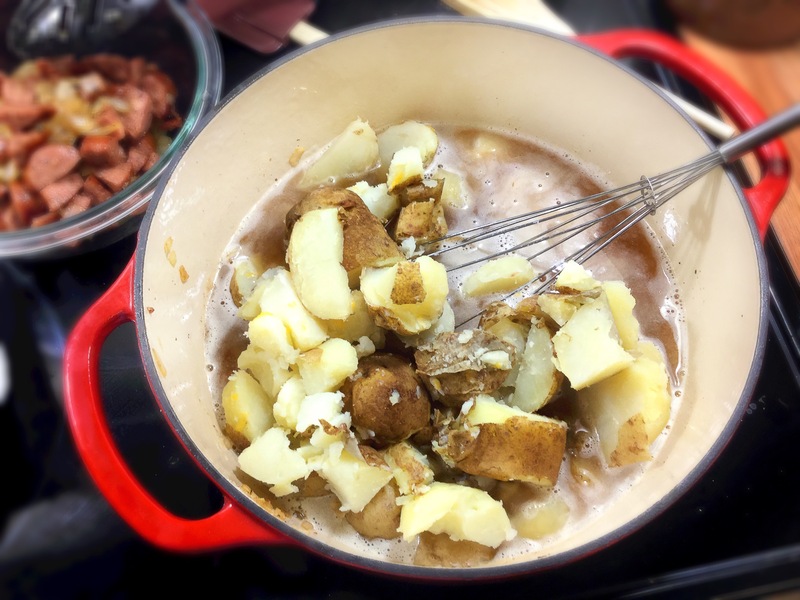 *While these above ingredients have been cooking, your potatoes should be ready. IF you do not like potato “skin”, youre more than welcome to remove. In our home and in this recipe we actually prefer it. 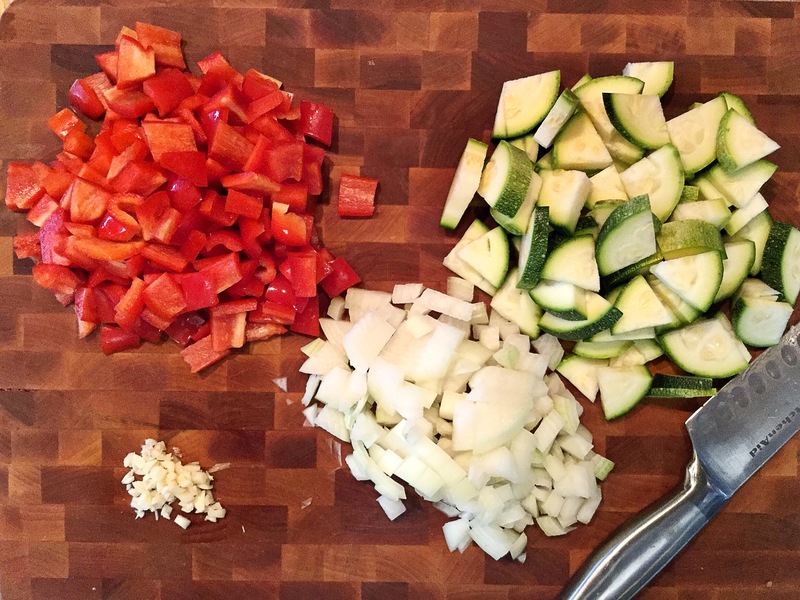 It adds great color, flavor and texture to the meal. So, anyway, just roughly cut up the baked potato, skin or no skin. Back to the dutch oven! 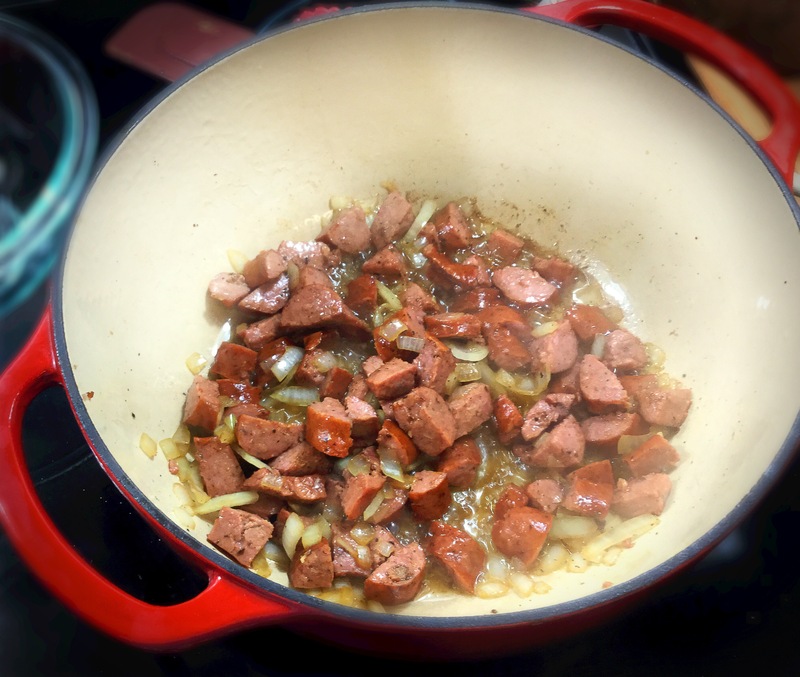 Sprinkle the flour into the bacon and sausage renderings and whisk till a rue is formed (thick and clumpy basically). 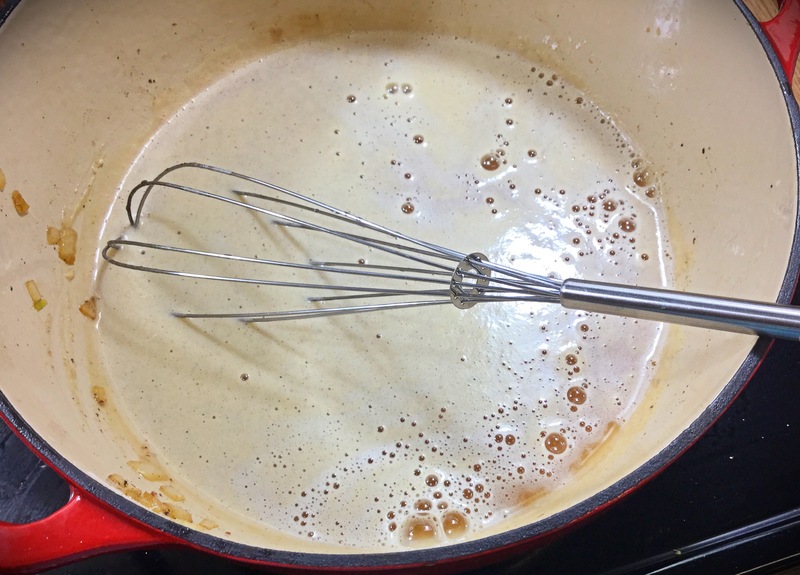 Next pour in the entire beer while continuously whisking followed by the chicken broth till smooth. Now add in those cut up baked potatoes and mash up in the liquid. I like to leave a bit of chunks in my soup, so I just use a good, old-fashioned, hand-held potato masher till I like what I see. 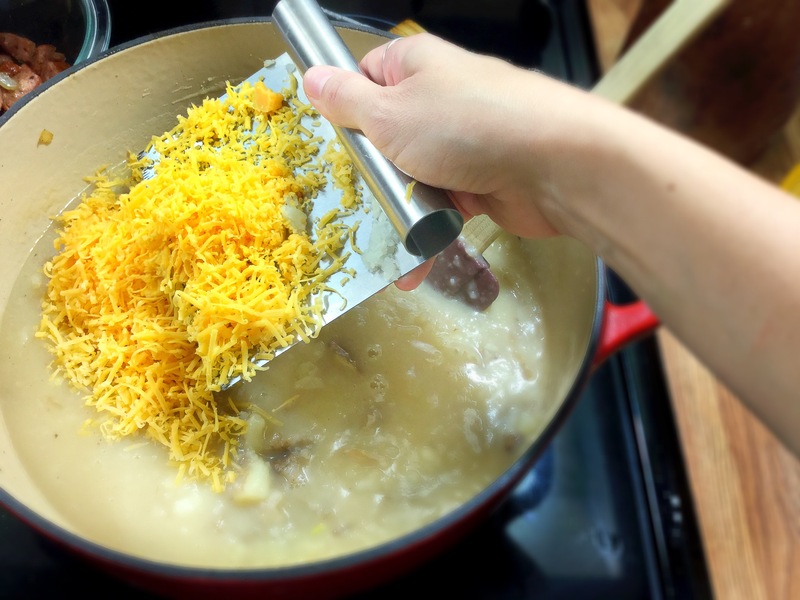 Next, stir in the cups of shredded cheddar cheese until melted, followed by the milk. 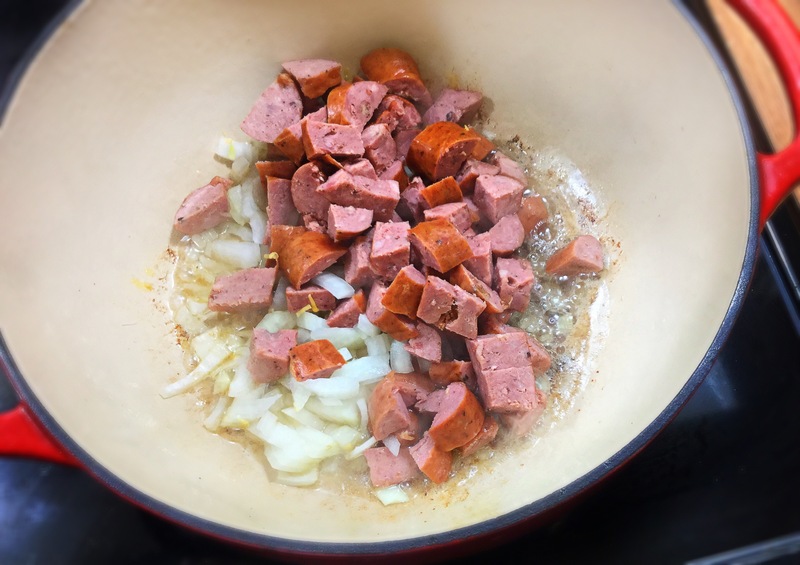 Bring up to a boil and then down to a simmer and stir back in the bacon (crumbled) and the sausage and onions. Let sit and thicken up for about 10-15 minutes. 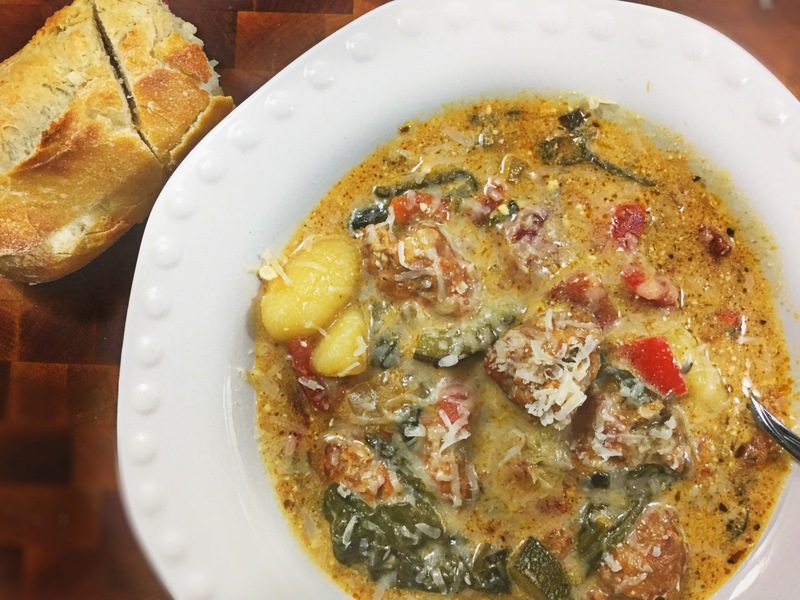 Ladle into bowls and top with the garnishes of your choice and a hunk of fresh, warm bread….this tastes best with a cold brew on a cold day with the ones you love..